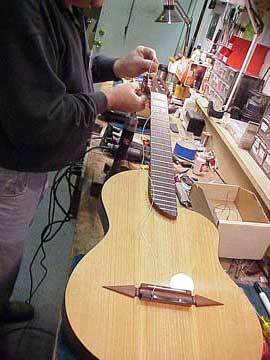 Steve Crisp is the head of setup (and other things as well) at Turner Guitars in Santa Cruz, where he needs to string and set up nylon string classical models every day. He showed me this cool little fixture he has for classical guitar restringing, and I immediately went home to make one for myself. Check it out. 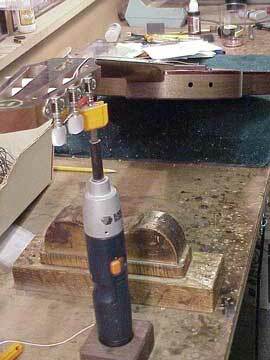 That's a regular cordless driver with a regular string winder chuck mounted in it. 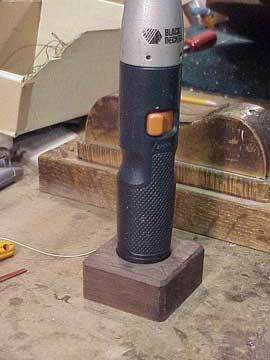 Just a simple wooden stand, which Steve made to fit the base of the driver. You can walk away from the guitar with the tuner chucked in the driver. 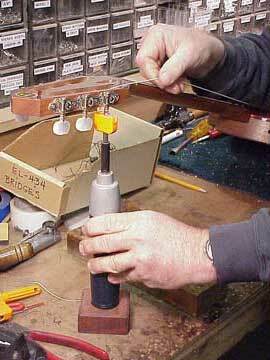 And you can use both hands to work with the squirmy nylon strings as you attach them at either end. Couldn't be simpler, eh? That's what makes it such a great little idea. Steve reminds us that you can make the base larger, clamp it down, or simply drill a hole in the bench for the tool handle if you feel the need for more stability. 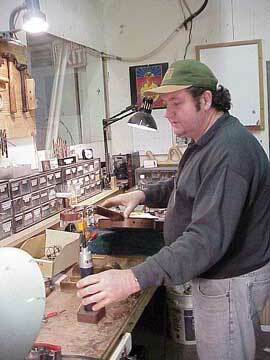 He invited me to knock the guitar over, and I was surprised at how stable this rig was. Too bad this only works for classicals! But then, they're the ones that take the most cranking , aren't they?